This entry was posted on Monday, November 16th, 2009 at 11:47 am	and is filed under Games. You can follow any responses to this entry through the RSS 2.0 feed. Both comments and pings are currently closed. Nice, I remember this game! My favorite part was the pitch black farmhouse basement, and all the various descriptions you’d get from FEELing the walls, floor, and ceiling, and LISTENing for noises in the dark. Did you know there was a sequel? Yes, three in fact! And a very weird sci-fi adventure which I hope to cover here sometime (Oo-Topos). 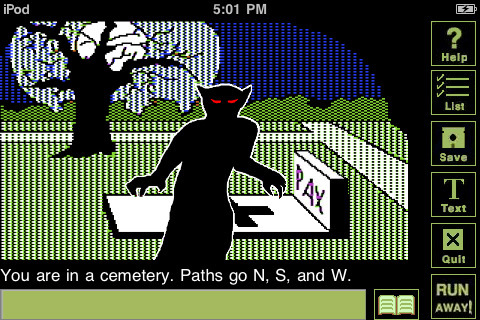 There’s a vast amount of text adventures out there that still deserve our attention. Did you have a tickling sensation when you read the word “PolarWare”? I know I did. Tee-hee… now, if someone would be so kind enough to port Legend of Faerghail? Or better yet, Moebius! Oh, yes! … maybe then I’d even buy an iPhone. Weeell, you do have a classic C64 rogue game being ported (Sword Of Fargoal — hehe, it even sounds similar) so we’re getting there. Really, there’s a whole retro revival movement on the iPhone so it’s currently the most exciting platform for us geeks. Plus, you even have some great modern RPGs as well: The Quest, Undercroft, and a few others.